During invoice entry, you can override system-generated invoice dollar amounts.The system immediately alerts you if the dollar discrepancy falls outside your user-defined tolerances.PMX's paperless procurement software automatically calculates sales tax from the tax percent on the purchase order and the taxable dollar amounts on the invoice. 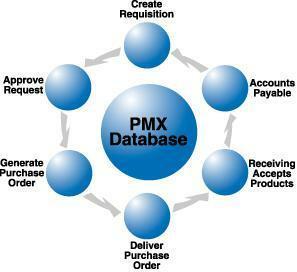 PMX immediately alerts you if freight charges are not authorized on the invoice. You can automatically allocate freight charges and taxes to predefined expense accounts or prorate over the invoice line amounts. During invoice entry, you can view the complete purchase order from the Purchase Order Management System, including any comments from the buyer and all receipt activity against the purchase order - all in a paperless purchasing environment. You can process multiple invoice types, contract, including prepaid, credit memo and debit memo invoices with this robust Purchase Order Management System. Unique order numbers,Distinct Order Types,Multi-Currency,Contract numbers,Multiple Line Items (pick from Items File or manual entry),Extensive item description,Designate mandatory fields,Order Approval sign-off (using Remote Request Module),Controlled order amendments with full audit report,Generates Supplier copy of order,Internal copy of order (includes expenditure codes),Comprehensive 'Find Order' facility (+ data export) Record payments,Match Invoices. Epiq SRM puts an entire organization in touch with its suppliers through collaboration and real time processes that maximize supplier performance product cost through:Easy to use screens and displays for suppliers,Long term,profitable relationships with suppliers,Real time bidding and Internet enabled, automated negotiation,Epiq SRM connects employees and suppliers to online business processes to make supplier contact, pricing, and inventory management more efficient and lower overall costs.